i was just wondering i bought the book on amazon and i just wanted to know if the models are easy to fold. I've folded almost every model Sara has made a video for. 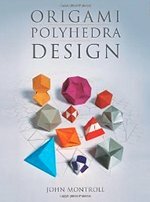 If this book is the one i think it is, then when I got it from the library where I used to live I tried a lot of the models and I was only successful with the stellated octahedron; if memory serves right all the others were very complicated. I may try the book again though since I have gotten significantly better since then. This book is relatively new (October 2009), are you sure it's the same book? I've folded several models from the book, and must say that many are easier to fold than the stellated octahedron. There are of course also models in there that are harder to put together.